IT’s a busy morning at the clinic. My next patient is a 62-year-old man. After some small talk, he quickly turns to the point of his visit: evaluation of suspicious skin lesions on his back. My ears prick up at this news. Now he’s more concerned and quickly agrees. I awake the next morning with this patient in my thoughts, consumed with “what if” scenarios. What if he has a stroke next month; what if an aortic aneurysm ruptures next week; what if he dies from a berry aneurysm tomorrow? When I call his home to remind him of the importance of following up with a primary care doctor, I get a voice message instead. Because of HIPPA rules, I can’t leave detailed information about his health on the answering machine. She talks nonstop without giving me a chance to respond. I imagine that she’s frightened by this unexpected information about her husband’s health. Despite her questions, I inform her that I can not discuss her husband’s health information without his consent. Understandably, she’s frustrated. She tells me that she will have her husband give me a call. We have tried to telephone you a few times; however, due to HIPPA rules we were not able to leave a detailed message. Although your skin lesions were benign, the family history of aneurysm prompted us to check your blood pressure. The readings were high, and the fact that you don’t have a family doctor led us to recommend that you see a generalist (internist, family physician) to get this properly evaluated. We don’t want you to worry unnecessarily. At the same time, we don’t want to ignore a possible health risk. We will be happy to talk to you about this or facilitate an appointment with an appropriate generalist. Please let us know if we can be of service. Another week goes by, and I hear nothing from the patient. I had hoped that he might have scheduled a proper evaluation with a primary physician. Not getting back to me was not an issue, as long as I knew that he would help himself and ultimately his family. A patient’s visit is a window of opportunity. In this case my patient had no concerning skin lesions; however, he may have been here for another reason. Although he implied that he had made the appointment just to humor his wife, revealing his family history might have been a cry for help. One probably would not expect to hear about a potential aneurysm at a dermatology appointment; however, as physicians, we have a duty to try to help our patients with other problems as well. As dermatologists, we are care-givers first, specialists second; we strive to treat the whole patient, not just their skin disorders. Acknowledgement: Sincere thanks to Brian Maurer for his gentle and expert editing. Yoon Cohen, D.O., is a resident at Alta Dermatology in Mesa, Arizona. 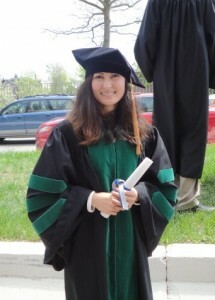 A native of South Korea, she did her medical school at the University of New England in Biddeford, Maine. This entry was posted in Cohen, Yoon and tagged dermatology visit. aneyrysm, doctor-patient relationship, hypertension by humanemedicine. Bookmark the permalink. Thanks so much for the wonderful article. A good reminder for us to treat the patient as a whole. The secret of patient care is to care for the patient – I think Peabody said that.